Are China’s official GDP growth number exaggerated? Hunter Clark, Jeff Dawson and Maxim Pinkovskiy from the New York Fed and Xavier Sala-i-Martin from Columbia University use satellite measurements of the intensity of China’s nighttime light emissions to proxy for GDP growth. Their estimate of Chinese GDP growth, since 2012, was never appreciably lower, and was in many years higher, than the GDP growth rate reported in the official statistics. For analysts of the Chinese economy, doubts about the accuracy of the country’s official GDP data lead many to seek guidance from alternative indicators. These nonofficial gauges often suggest that Beijing’s growth figures are exaggerated. This conclusion, however, is not supported by our analysis, which draws upon satellite measurements of the intensity of China’s nighttime light emissions—a feasible proxy for GDP growth. More worrisome, however, is that China’s recent GDP growth has been driven by a historic credit boom that does not appear sustainable.Recent efforts by Chinese authorities to rein in credit growth are encouraging, but they may be challenging to manage and could spill over into international markets given the size of the Chinese economy. In the eyes of many observers,China’s economy seemed to be entering a tailspin in 2015. And yet, the official GDP data showed a negligible slowdown in growth. The financial press pounced on these “questionable” statistics, citing a now-famous 2007 exchange between Premier Li Keqiang, then a provincial Communist Party secretary, and U.S. Ambassador Clark Randt. Li admitted that he preferred to assess the performance of his province’s economy by averaging the growth rates of electricity production, rail freight, and bank loans. Li’s metric—since dubbed the “Li Keqiang index”—has declined for four of the past six years, recording a precipitous drop in 2015. Such signals have prompted many observers to believe the Chinese economy is weaker than official statistics portray it to be (notwithstanding the fact that the index rose over the course of 2016). Skeptical of the official numbers, many Wall Street analysts have constructed their own models of Chinese economic growth, suggesting that growth in the last quarter of 2015 was indeed much lower than the official rate of 6.8 percent. Some analysts claim that the “true” figure is less than 5 percent. These nonofficial indices are all based on assumptions about and models of the Chinese economy that are difficult to express, let alone test. 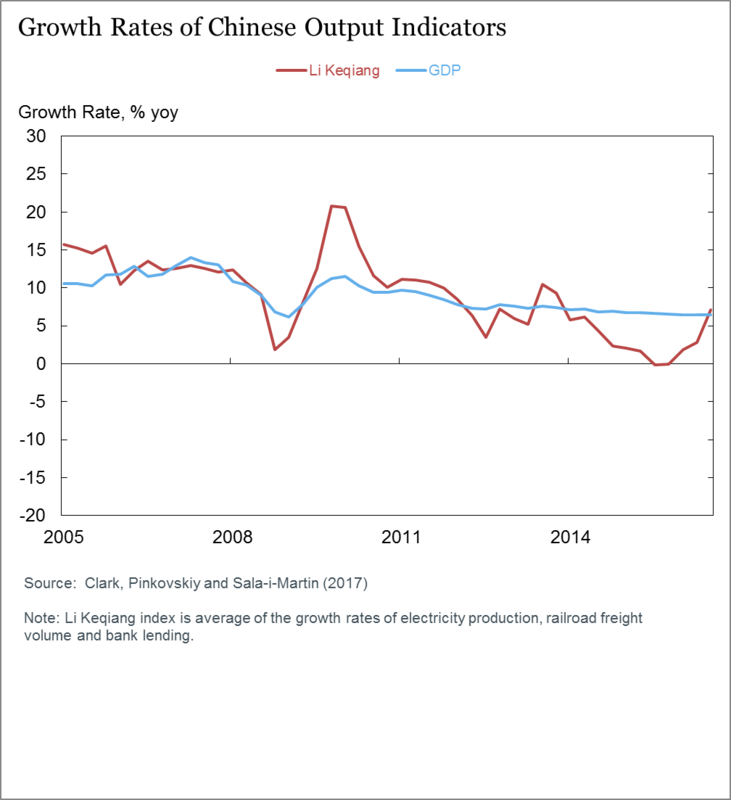 As the chart below shows, the components of the Li Keqiang index—the growth rates of electricity production, rail freight, and bank loans—have followed separate trajectories over the past twelve years. Placing greater weight on any one of these inputs would produce a much different stream of GDP growth estimates. We see that the growth rate of bank loans has been very stable over time, hovering around 12 to 13 percent year over year, except during the financial crisis of 2008 and its immediate aftermath. Meanwhile, the rail freight growth series has shown a sustained decline over the past twelve years, reaching a low point in December 2015. This precipitous deceleration was one reason that market participants one year ago were so concerned that official statistics were not reflecting the true state of the Chinese economy. However, there are more innocuous explanations for the decline of rail freight growth, such as the structural transition of the Chinese economy from heavy industry toward services. 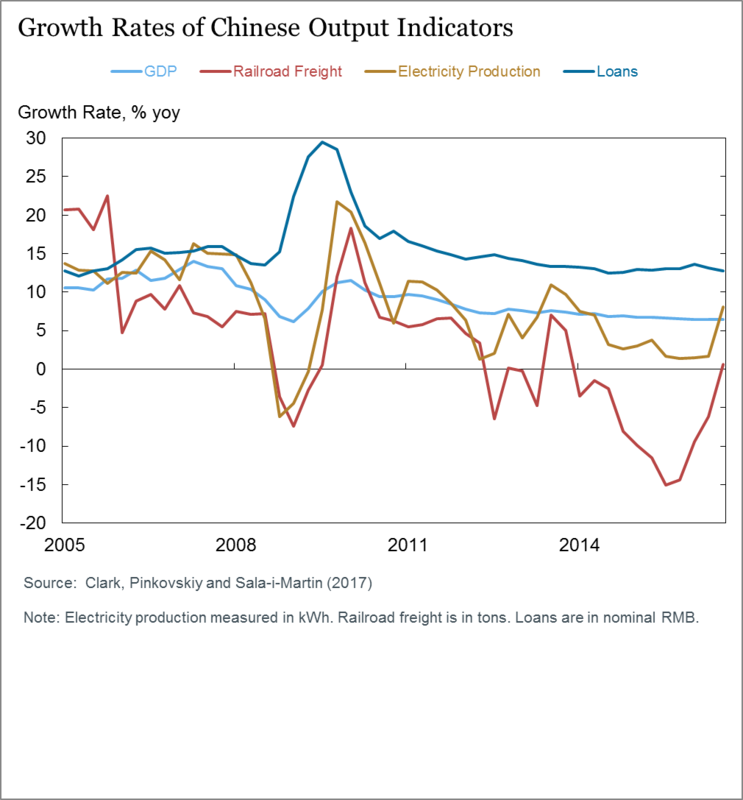 In light of the structural changes under way in the Chinese economy, we might devise a modified Li Keqiang index, placing more weight on the bank loans series than on the rail freight series, as opposed to weighting the three growth rate series equally. This approach would have engendered much less concern at the end of 2015. To resolve these credibility issues, we need to develop a transparent, data-driven procedure centered on an independent gauge of Chinese economic growth. We argue that such a measure exists in the form of satellite-recorded data on the brightness of nighttime lights across Chinese provinces over time. It has been well established that growth in nighttime light intensity is a good proxy for economic growth. The heart of our analysis is a regression of growth in nighttime lights across Chinese provinces and over time on the growth rates of the various statistical series used to calculate the Li Keqiang index. Using the key assumption that measurement errors in nighttime lights are independent of the measurement errors of the other variables utilized, the regression coefficients on the statistical series are proportional to the optimal weights that should be applied to these measures in order to derive predictions for true Chinese GDP growth. We find that the components of the Li Keqiang index should not be assigned equal weighting, as is typically supposed. In fact, our analysis indicates that bank loan growth should be given six to eight times more weight than rail freight growth, with the optimal weighting on electricity production growth somewhere in between these two. The implications of this reweighting on our optimal estimate of Chinese GDP growth are profound. We find that since 2012, our estimate of Chinese GDP growth was never appreciably lower, and in many years was higher, than the GDP growth rate reported in the official statistics. Adding other series besides those incorporated in the Li Keqiang index does not change our results. In fact, our estimate for Chinese growth shows an appreciable acceleration in 2016, even as the official growth rate remained virtually unchanged. The durability of credit growth as a predictor of China’s overall economic growth raises some cause for concern. Bank lending and other forms of debt have increased dramatically in China in recent years, accounting for roughly one-half of all new credit created globally since 2005, and the recent emphasis from Chinese leadership on managing “financial risks,” while encouraging, suggests that credit growth could slow meaningfully going forward. The financial system also has become increasingly complex and more reliant on less stable forms of financing, although there are several features of China’s financial system that may allow authorities to manage the slowdown gradually and reduce the threat of a financial disruption. Nonfinancial debt in China has increased from roughly $3 trillion at the end of 2005 to nearly $25 trillion, while banking system assets have increased sixfold over the same period to over 300 percent of GDP. In 2016 alone, the amount of credit outstanding increased by more than $3 trillion, with the pace of growth still well above nominal GDP. As a result, the “credit-to-GDP gap”—the difference between the debt-to-GDP ratio and its long-run trend—has reached almost 30 percentage points. The international experience suggests that such a rapid buildup is often followed by stress in domestic banking systems. Roughly one-third of boom cases end up in financial crises one-third of boom cases end in financial crises and another third precede extended periods of below-trend economic growth. Is Credit Now Offering Less of a Boost to Growth? An additional cause for concern is whether credit is providing less of a boost to growth than it has in the past. Specifically, does the credit impulse—the change in the flow of new credit as a percentage of GDP—appear to be providing less of a lift in output for each additional yuan of credit? This underscores questions about how much lending is going to unproductive “zombie” companies or toward financial speculation. Indeed, the boost to output does appear to be diminishing over time. 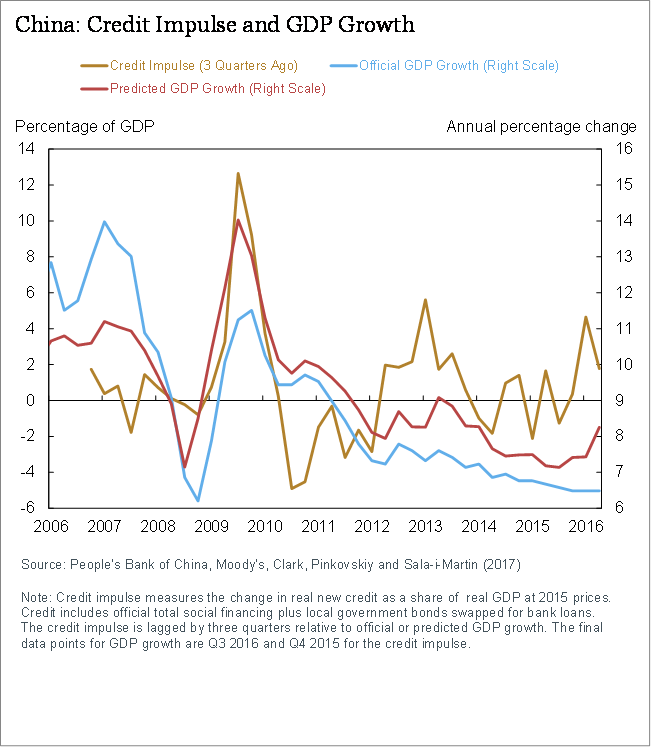 As illustrated in the chart below, when using China’s official figures, since 2012 there has been very little pickup in GDP growth in response to the credit impulse, although the expected increase in growth has been a bit more evident when using the nighttime lights GDP proxy. Either way, the impact of the impulse is considerably less than in earlier years. Improvements in credit efficiency going forward will require reforms, such as hardening budget constraints at state-owned enterprises and local governments, reducing implicit and explicit guarantees in the financial system, improving regulatory oversight and coordination, and slowing aggressive balance sheet growth at smaller financial institutions. Despite its vulnerabilities, China’s financial system has several features that reduce the associated risks. Unlike many emerging market credit booms that have ended in busts, China’s credit growth has been funded primarily by high domestic saving, mainly in the form of bank deposits. Chinese authorities have sufficient liquidity tools, including high required reserve ratios, the ability to extend short-term liquidity via an array of facilities, and a financial sector dominated by state-owned lenders and borrowers. China also has substantial fiscal resources to address losses in its financial system and among troubled state-owned debtors. This last consideration is very important; the Chinese government’s strong balance sheet should provide the necessary capacity to absorb potential losses from a financial disruption. Still, the speed and increasing complexity of the country’s credit growth suggest that there could be significant benefits for China in comprehensively addressing its banking system and in financial reforms. 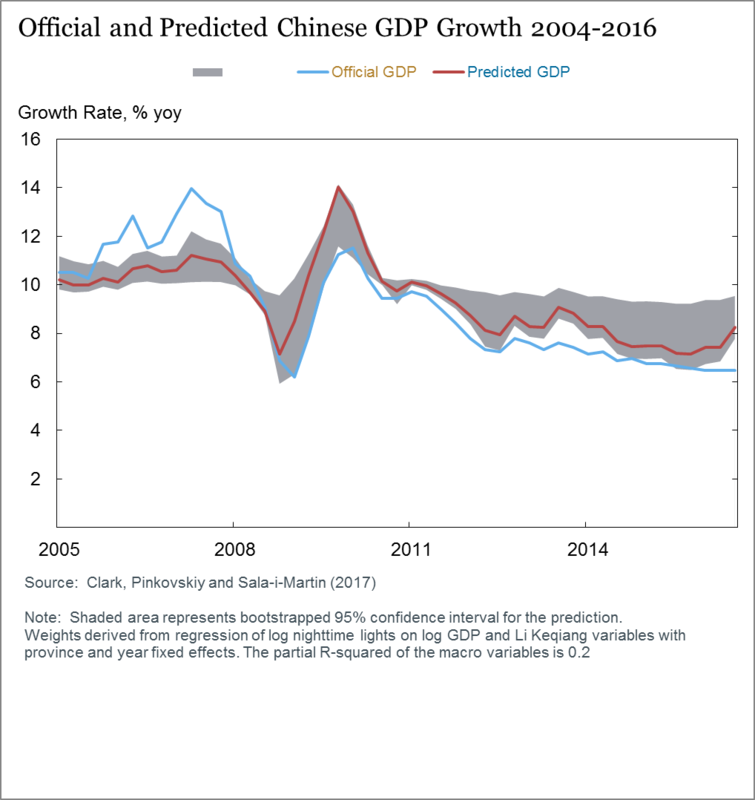 Hunter Clark, Maxim Pinkovskiy, and Xavier Sala-i-Martin, “Is Chinese Growth Overstated?” Federal Reserve Bank of New York Liberty Street Economics (blog), April 19, 2017, http://libertystreeteconomics.newyorkfed.org/2017/04/is-chinese-growth-overstated.html.